The First Part, Which You can Read HERE, Defined What Fibromyalgia is. 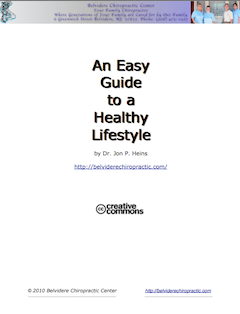 This Second Part Will Discuss What the Symptoms of Fibromyalgia are, Followed by, The Third PartThat Will Discuss What Can You Do to Ease the Symptoms of Fibromyalgia, which Will Be Posted Sometime Next Week, and Then the Final Fourth Part That Will Answer the Question: How Can Chiropractic Care Help Fibromyalgia? The Following Week After That. If You Don’t Want to Miss this Series just Subscribe to the Email Updates HERE. Or You can Subscribe to the RSS Feed HERE (See: What’s This?). 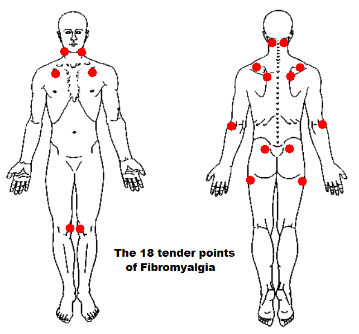 The Symptoms of Fibromyalgia are Very important since Fibromyalgia has No Clinical Tests to Detect it so a History of Specific Symptoms and Specific Physical Examination Findings are the Only Way to Diagnose it. A History of at least 3 Months of Widespread Pain, that Affects all Four Quadrants of the body (both sides above and below the waist). Fibromyalgia Sufferers will also typically have Fatigue and Not Just the “I’m Tired” Feeling We All Experience from Time to Time, it’s more like a “I Get Exhausted and Need to Rest after doing a Simple Chore” Type of Fatigue. 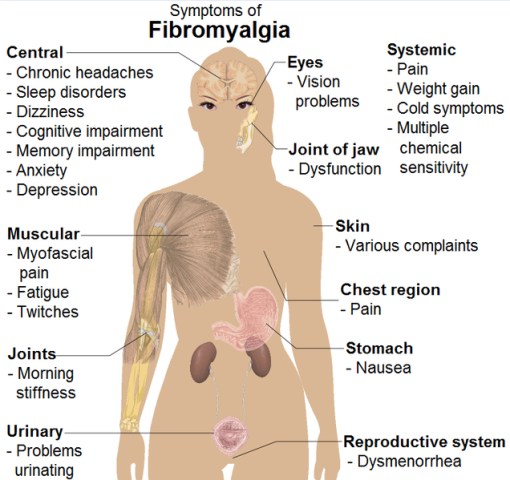 In addition to this Fatigue, Fibromyalgia Sufferers also Tend to Have: Troubles Sleeping, Anxiety, Depression, Stress, Numbness in Hands and Feet, Headaches, Pain or Numbness in the Face, Jaw Pain (Temporomandibular Joint Disorder –TMJ), Irritable Bowel Syndrome (IBS), Memory Difficulties (known as “Brain Fog” or “Fibro Fog”), and Heart Palpitations. 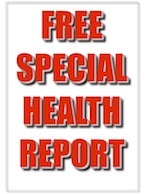 I mentioned that Fibromyalgia has No Clinical Tests to Detect it, However, Laboratory and X-ray Tests are Typically Done to Help Confirm the Diagnosis by Ruling Out other Conditions that Have Similar Symptoms such as: Neck and Lower Back Degenerative Disease, Chronic Fatigue Syndrome, Depression, Cancer, HIV infection, Hypothyroidism, Irritable Bowel Syndrome, Lyme’s Disease, Rheumatoid Arthritis, and Sleep Disorders. This short 2 minute video I found below really hits home with what fibromyalgia is, what many of the symptoms are and more importantly, how these devastating symptoms effect those who suffer from them. Next week I will discuss What You Can Do to Ease the Symptoms of Fibromyalgia, That Way if You or Any One You Know is Suffering from this Terrible Debilitating Condition, You Can Do Something About it. Thank you so much for the u-tube video…it will help my family understand! Denise: My pleasure. Happy to help anyway I can.